Hindi channels Colors and Colors HD are all set to present the world television premiere of Deepika’s recent movie 'Bajirao Mastani' . In the early 18th century, the court of Maratha Chhatrapati Shahu (Mahesh Manjrekar) from Satara Empire a new Peshwa, the equivalent of a modern-day prime minister. In spite of Shripad Rao's (Aditya Pancholi) self-nomination as the Pant Pratinidhi, Ambaji Pant (Milind Soman) chooses to nominate a young Bajirao (Ranveer Singh). To test his spiritual wisdom and knowledge of weaponry, Shripad challenges Bajirao to split a peacock feather with an arrow. Bajirao succeeds and is given the title of Shrimant Peshwa. Ten years later, his wife Kashibai (Priyanka Chopra) is visited by her widowed friend Bhanu(Snehlata Girish Vasaikar), whose husband was accused of spying on Bajirao and hence was executed. She bitterly forebodes that just like she longs for her husband, Kashi, too, will yearn for Bajirao. While traveling to Sironja, an emissary from Bundelkhand infiltrates Bajirao's tent and demands his help in fighting invaders. She reveals herself to be Mastani (Deepika Padukone), the daughter of the Rajput King Chhatrasal (Benjamin Gilani) and his Persian queen, Ruhani Bai. Impressed by her skills as a warrior, Bajirao assists her with his army and defeats the invaders. Chhatrasal is overjoyed and insists that Bajirao spend Holi with them. Mastani and Bajirao develop feelings for each other and he gifts her his dagger, which is a symbol of marriage among the Bundelkhand Rajputs. He soon departs for Pune, where Kashi greets him with a tour of their newly-built Shaniwar Wada and shows him the Aaina Mahal (hall of mirrors) which allows her to see him from her room. Determined to pursue her love, Mastani arrives in Pune but is treated harshly by Bajirao's mother Radhabai (Tanvi Azmi) and accommodated in the palace for courtesans. She tolerates this insult and appears to dance before Bajirao on the occasion of Parava. Radhabai scornfully offers her the occupation of a royal dancer but refuses to accept her as a daughter-in-law. Mastani travels to the King and expresses her desire to be with Bajirao before leaving to wait for him at a ruin across the river. Bajirao crosses the river in the midst of a storm and chides her persistence, reminding her that he is already married and that his court will never respect her if she is with him. She agrees despite his warning and he declares her as his second wife. Bajirao leaves to confront the Nizam of Deccan (Raza Murad) and although his odds of victory are slim, he returns successful. A pregnant Kashi witnesses Bajirao embracing Mastani, who is also expecting, in the Aaina Mahal and leaves for her mother's home. She returns months later with her newborn son, who is named Raghunath in joyous celebration. Mastani also gives birth to a son, whom Mastani and Bajirao name Krishna Rao, but when Krishnaji Bhatt, the head Brahmin priest, refuses to conduct the naamkaran (Hindu christening ceremony) and he is deemed illegitimate, Bajirao names him Shamsher Bahadur. A few years later, Kashi's eldest son Balaji Baji Rao (alias Nana Saheb, played by Ayush Tandon) returns from Satara and expresses hatred towards Mastani for disrupting his mother's marriage. Kashibai is informed of a treacherous plan to murder Mastani and her son during a festival by Shiva Bhatt, another Brahmin priest. Kashibai reluctantly relays this news to Bajirao, who rescues both of them from certain death. Following the murder of Shiva Bhatt by Krishnaji Bhatt, Bajirao is enraged. For Mastani's safety and to grant her a royal abode, Bajirao builds Mastani Mahal for her. Bajirao, however, is broken hearted due to the betrayal of Radhabai and Chiman Appa, when Pant informs him that he must defeat Nasir, the vengeful son of the Nizam. Bajirao proclaims that even if he loves Mastani, his life and allegiance is always to his cause, so he decides to enter the battlefield. After Bajirao leaves for battle, Radhabai and Nana Saheb imprison Mastani and Shamsher Bahadur. After Bajirao single-handedly defeats Nasir, he receives news of this treachery and collapses from his injuries. 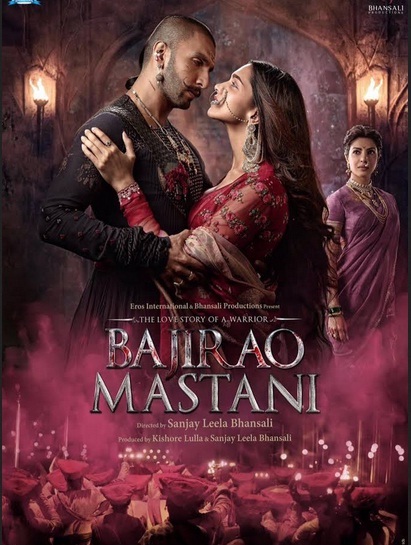 Kashi pleads with Radhabai to release Mastani so that Bajirao can recover, but her attempt is futile as Balaji Baji Rao burns the letter and refuses to release Mastani. Bajirao, delirious due to his sickness, dies from the trauma of his hallucinations, just as Mastani passes away in captivity. The two fated lovers are shown to be united in death. The world television premiere of ‘Bajirao Mastani’ will air on 23 April 2016 at 9 pm on Colors and Colors HD.